Lukla Airport is the contemporary gateway to any trekking adventure in Everest region of Nepal. Before the construction of this airport lots of trekkers and climbers used the old route via Jiri for such a remarkable journey. 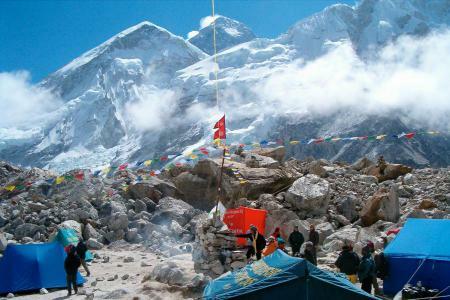 Jiri Everest Base Camp Trek is also called as Everest Base Camp Classical Trek. You will be hypnotized by the reverie feeling that you gain while embarking on this trail to Everest Base Camp (5364 m). Follow the trail once trekked and used by legends of Nepal mountaineering. If you wish to observe the lower belts of Khumbu region and want to understand the culture of people living in lower Khumbu then this is an ideal trail to walk in Nepal. Jiri Everest Base Camp Trek journey starts with bus drive to Jiri which is located in east from Kathmandu. During autumn and spring season one can take bus drive directly up to Salleri. From this place the walking journey starts. The most ravishing part of this trekking in Nepal is the wonders of Mother Nature and multiethnic people villages. Unlike the contemporary Everest Base Camp Trek route the trail showcases plenty of green lush forests, streams, waterfalls and villages. 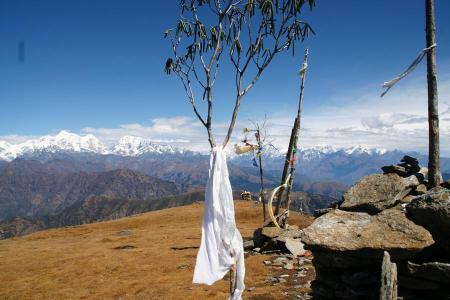 Places like Nunthala, Bupsa and Surke will be on the way before reaching Phakding to meet the modern EBC trek trail. On the way rhododendron, pines, magnolia and many more vegetations can be experienced. Villages of Rai and Sherpa community along with their terraced farmlands endow different understanding of rural Nepalese people residing near Mt. Everest. Once you have trekked for more than three days you will reach the Phakding. We will follow the normal modern route towards Everest Base Camp from this place. Please visit our Everest Base Camp Trek package in our website for more information from this place. While returning from the trip we will take the Lukla route. Scenic mountain flight from world’s most extreme airport to Kathmandu will be our last action of this journey in Nepal. 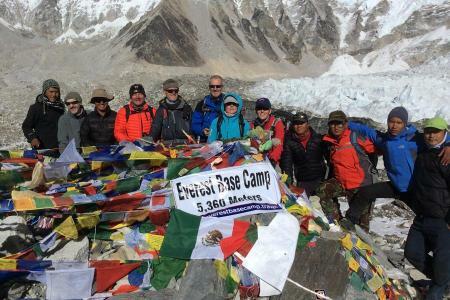 Book the Jiri Everest Base Camp Trek package and experience classic trek of Everest region. If you want to experience culture, traditions, woods, wildlife along with Himalayan wilderness in Nepal this is the only trekking route which offers all. 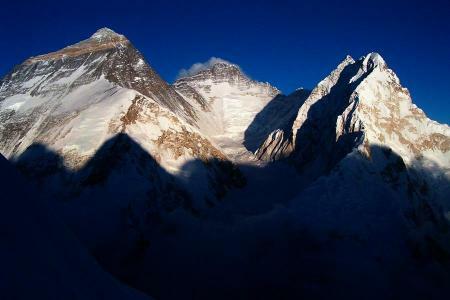 Therefore, without any delay just embark on your quest of reaching base camp of Mount Everest with us. We are ready to take you for astounding high altitude trekking in Nepal at heartland of Mt. Everest. After arriving at Tribhuvan International Airport, you will be welcomed by the representative of Unique Adventure International and you will be shifted to your hotel. The employees in the hotel will manage your accommodation and check in. In the evening, a welcome dinner will be organized in the hotel. We trek for 7 hours today and our trek begins with a firm mount through cultivated fields and small Tamang villages. We come across forested areas and wrapped grazing land before moving down to Shivalaya. After steady climb we arrive at Deurali pass (3000m) where we stay at guesthouse. 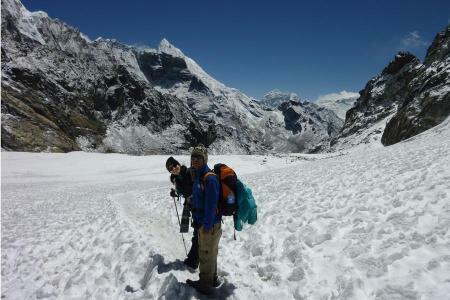 From Deurali, the track continues moving down to Likhu Khola prior to continuing to Sete. Trekkers often observe an extensive variety of wildlife on the way. We today walk for 6 hours and stay at guest house in Sete. The most rewarding part of trekking to Junbeshi is walking through the rhododendron, birch, magnolia forests which cover the Solu-Khumbu region. From here, the track mounts up to Lamjura Pass at (3,500m), where you will get a chance to see Mount Everest for the first time. After taking restate the pass, we move down to the pleasing Sherpa village of Junbesi. We will be walking around 6 hours today and overnight at guest house in Junbesi. Today we enter to agricultural land of Rai and Sherpa community. We walk beside the Dudh Koshi River and From Dudh Koshi River, our track reach to Kharikhola (2050m). Then, we pass through Juving (1680.) a big Rai village. Now, we arrive at Bupasa where you will go around Buddhist Monastery and explore the village. We today walk for 6 hours and stay at guest house tonight. Moving ahead from Bupsa, we reach Khari La Pass (2880m.) walking through rhododendron and oak forest as well as a small Sherpa community and tea houses. From this spot, you can sight superb view of peaks such as Cho-oyu (8201m), Numbu (6960m), Thamserku (6629m.) and Gyangchung Kang (7922m). We have 5 hours walk today. We stay at guest house in Surke. We depart from Surkhey and trek to Phakding (2610m), walking for 5 hours. On the way, we could enter to the villages such as Mushe (2650m) and Chhiplung (2700m). Ultimately, we reach to Phakding and stay at guesthouse. We today have a day to become accustomed and adjust to the surroundings. There is a day tour where one can visit Sagarmatha National park on the small hill discover about the range of plants and animal life of the Everest region. 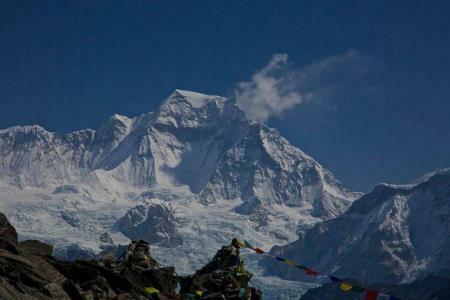 Optionally, we can go for a short hike to Syangboche to spot the terrific views of Lhotse (8516meter), Mt. 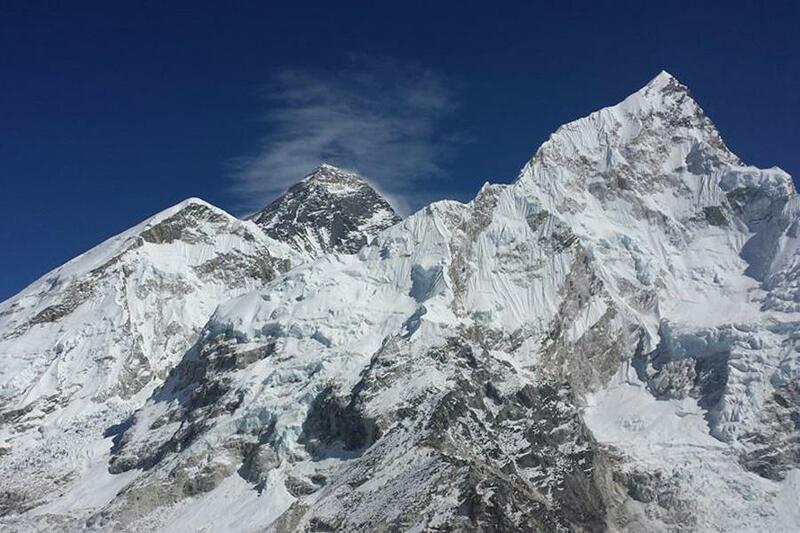 Everest (8848meter), Amadablam (6812meter), Mt. Thamserku (6608meter etc. ), overnight at Guesthouse. We walk beside the glacial waters of the Dudh Koshi with breathtaking views of the peaks. We trek to an elevation of 3860 m and the fairly flat way will take us today to view astonishing panorama of Ama Dablam, Nupte, Mt. Everest, the famous Gomba, Tengboche Monastery and more. The track goes on and we can see wild lives like musk deer, colorful pheasant. Then the path slopes down to Dudh Koshi River where series of picturesque water driven prayer wheels. We walk for 6 hours and stay overnight at guesthouse. From Tengboche our path goes down to Debuche, and come across another suspension bridge on the Imja Khola, and climbs to Pangboche amongst thousands of Mani stones. We can see gigantic view of Ama Dablam and the trail lines up to the upstream closer to Imja River rather mild up toward Imja valley. The track shows way to Dingboche, the Sherpa settlement with the eye-catching terraced field and grazing animals. We stay at hotel in Dingboche. Today, we arrive at the village above Pheriche Valley. To the north part, we can see Lobuche Peak (6119m) and we walk by large flat and wide-open fields. Now, we cross the Khumbu River at Dughla (4620m). Also, you can see the fantastic view of Pumori (7145m) and, coming across the border in Tibet, Changtse (7550m), and the enormous walls of Lhotse and Nuptse. We walk for 5 to 6 hours today and stay at guest house in Lobuche. We today have 9 hours walk and it one of the challenging days while trekking. We walk beside the Khumbu Glacier and walk ahead up to Everest Base Camp (5365 m). The sight of the Khumbu Icefall from Base Camp is stunning. We reach to the moraines of Changri Nup Glacier; we make a series of small climb and fall that shows the path eventually to the astonishing glacial sands of Gorak Shep (5160m). And then, we leave towards the Everest Base Camp. We come back to Gorak Shep for the night. We trek for 7 hours. In the morning we climb Mount Kalapatthar (5545meter) and get the most superb mountain vista of Everest, the highest summit on the earth at 8848 meter other giant mountains- Nuptse, Chagatse, Pumori, Lhotse and numerous others. We make a quick fall to Gorak Shep, a small settlement at 5180 meters then return trek down to Periche. From Pheriche, we move down to Orsho, and then continue to Pangboche village. Here we can observe the ancient monastery in the region. And we leave peaks after us; our drop through Tengboche Monastery at altitude of 3860 m before returning back to the town of Namche Bazaar 3441m). We reach to Namche Bazaar in the afternoon. We trek for around 6 hours and stay at guesthouse. Today, we go back over the main track down to Dudh koshi then to Phakding. Moving along the track, k we reach to Lukla seeing different Sherpa villages coming across a suspension bridge above Thado Koshi. We stay at guest house after trekking for 6 hours. From Lukla we travel for 35 minutes and return back to Kathmandu from in the morning and move back to the hotel. Rest of the day we can relax. Day 22 : Transfer to airport, departure onward destination. Airport pick up and drop off, upon arrival and departure in Kathmandu (International and domestic both). 1 professional and friendly, A class government licensed and well English speaking mountain guide. 1 well experienced English speaking assistant guide if the group size exceeds 5+ persons. Well experienced and equipped trekking porter/s (one porter carry for 2 guest's luggage, 25 kgs - 30kgs). Food during the trek (full board with breakfast, lunch and dinner with tea/coffee and seasonal fresh fruits). All necessary trekking permits: Sagarmatha National Park and Trekkers' Information Management System (TIMS) fee. Internal flight Lukla - Kathmandu for guest and guide inclusive with all taxes and transfers. Ground transportation Kathmandu - Jiri. In worst case, assist with all rescue and evacuation arrangements. Unique Adventure sleeping bag and down jacket, duffel bag, area trekking map. First aid medical kit, Oxymeter to check pulse, heart rate and oxygen saturation at higher altitude. Nepal visa (can obtain at the airport or immigration counters at the borders: USD 25 for 15 days and USD 40 for 30 days and two passport size photographs is required).